Here’s a shortened extract from Stranded in the Six-Day War about how the seafarers on trapped ships in the Suez Canal created their own stamps – miniature works of art. Soon after their arrival in the Bitter Lake, some seafarers began to create their own GBLA stamps to stick on their letters – tiny, hand-crafted works of art made using a variety of materials found on board. Home-made stamp making required remarkable ingenuity. It continued throughout the time the ships were in the Suez Canal. Different methods were used, all involving painstaking work. Some stamps were drawn by hand, and printed using inks, crayons or even coffee grounds for colour. Other stamps were produced from potato cuts or carved from linoleum, and then coloured with inks. The Poles were the masters of stamp creation. Captain Brian McManus commented that the Boleslaw Bierut’s Third Engineer, Kassimir, was a talented artist and it took him more than two months to make a set of stamps. He produced the 14 Ships Issue in February 1968 – 14 different stamps showing each of the ships: ‘Hulls, accommodation, funnels, mast, derricks and cranes and all distinguishing features are shown in their correct proportion’. They were all accurately coloured and showed the national flag. It was an extraordinary achievement to do all this at the scale of a postage stamp. Each series of stamps had a theme; sport was a popular subject. The ships took it in turns to host sailing regattas and produced stamps to commemorate the event. Some stamps recorded life in people’s home countries and the wider world. In July 1969, a Polish electrician designed a GBLA stamp to mark the landing of the first human being on the Moon. Through their art, the seafarers maintained their connection with their homelands and the world outside. Since the seafarers used different currencies, paying for stamps was complicated. After a while, it was agreed that joining the GBLA entitled a member to a regular supply of stamps. In addition to the postage stamps, the ships were given identical rubber ‘Mailed on Board’ stamps, displaying an anchor with a ‘14’ on it, double stripes to represent the Suez Canal, the GBLA initials and the name of the ship. Returning crew members often took post back to their country, where the shipping company added national stamps and forwarded the letters. 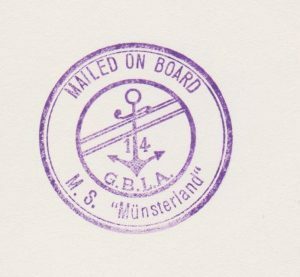 The rest of the time, once a letter had a GBLA stamp on it and had been franked ‘Mailed on Board’, it was cancelled by the vessel’s post office and sent to an Egyptian post office where Egyptian stamps were added. According to Captain McManus and Captain Hill, mail was sometimes franked by the Egyptian postal authority with only a GBLA stamp on it. Captain Hill believed this helped to prove the ‘independent sovereignty of the GBLA’ – as if the 14 ships formed a separate little nation in their own right. Hi Tony, which Seafarers link on Facebook do you mean please? Hi Cath, I’ve just finished your excellent book. A mine of useful information ! With reference to my earlier query, I would love to hear from you. Thank you very much for your kind comment. I replied straight away to your query through Amazon – perhaps you did not receive it? I need your own email address to send you the information that you asked for. Thanks for your contact through Amazon. I did attempt to send you my email address through Amazon but suspect that their filter blocked it? Thanks for getting in touch Vic Barton. Do you live in the UK? There may be another GBLA reunion in Liverpool in 2019 so please let me know if you’d be interested in coming if it happens. Hi Vic, when were you on the Scottish Star? I too was on board at the start of the voyage ending of course in the Bitter Lakes, I was the Galley boy looking after the passengers with the second steward, whose name I can’t remember, I was 17 + when we got stuck.